The picture above is me and my friend Dave as we were at the National Youth Workers Convention in Pittsburgh back in October. 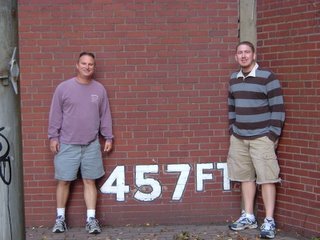 We are standing in front of what is left of the outfield fence at Forbes Field where Bill Mazeroski hit the game/series winning, ninth inning homerun to defeat the New York Yankees in the 1960 World Series. Pretty cool to see this place. The weekend worship services went pretty well. I have found some more people to serve in our audio-visual ministry. That is a blessing. At Fusion, we had our meeting for the 2006 mission trip to Paraguay. It was pretty exciting to see some of the students who game and their excitement for the trip. We won’t be taking a large group, but it will be a good group. Was reading Voyage of the Dawn Treader this weekend. In it, there is a character named Eustace. He is a selfish, whinning, idiot of a boy in the book. As Eustace, Edmund, Lucy, Caspian, and others travel, they came to Dragon Island. Eustace goes exploring by himself and gets lost, and eventually turns into a dragon. He becomes as physically ugly and repulsive as he is repulsive on the inside. Long story short, Eustace meets Aslan who is the King of all creation. Aslan tells Eustace that he must undress (take off the old) and redress (putting on the new). Eustace finds that he can’t undress by himself, so Aslan the Lion digs his claws in and pulls the scales away from Eustace. Eustace is then reclothed as he is returned back to human form. This chapter really spoke to me about taking off the old and putting on the new. I need to continually take off the old, the sinful, the unholy and allow God to dress me in what is righteous, holy, and just.